Known locally as the Long Stone, the standing stone at Neale is only 1.1 metres in height by 0.45 metres wide. Although small in size this stone plays a big part in Irish Mythology. 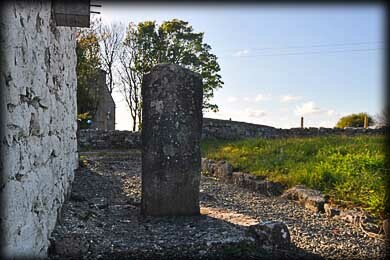 It is reputed to mark the burial place of Lugh Lamhfhada (Lugh of the Long Hand) who was slain in the first Battle of Moytirra near Cong. Lugh was the son of Nuada, King of the Tuatha De Danann who was killed in the second battle of Moytirra in Sligo. Nuada is said to be buried under the Labby Rock at Carrickglass. 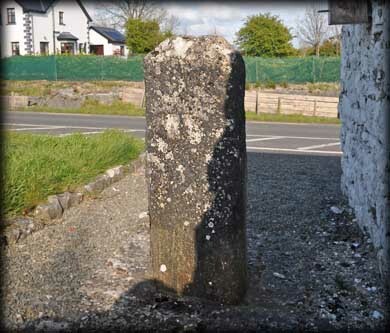 It took us time to locate the stone because it is marked on the OS Map at a fork in the road south of Neale on the road to Cong. The stone is actually located at the north gable of a small cottage before the turn for Cong. Discovery Map 38: M 1833 5833. Last visit April 2012.